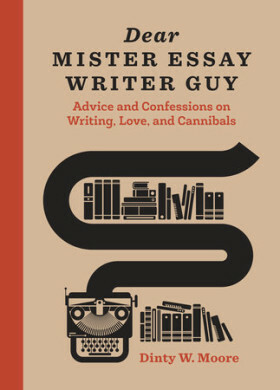 Dear Mister Essay Writer Guy: Advice and Confessions on Writing, Love, and Cannibals pairs questions sent in by contemporary essayists – Phillip Lopate, Cheryl Strayed, Roxane Gay, Diane Ackerman, to name a few – with humorous essays written in various unconventional forms: on cocktail napkins, in Google maps, as Facebook posts, and on the backs of cannibals. Well, that last part isn’t exactly true. But the inspiration for this devilishly irreverent book is the sixteenth-century father of the essay Michele de Montaigne, and he loved cannibals. Drunkenness, befuddlement, the occasional staggering. What’s not to like? Moore presents a guide to writing essays that is both brilliantly instructive and wonderfully entertaining … Highly recommended for writers and anyone who loves to laugh out loud while they read. So perhaps it is time to BUY THE BOOK. Or at least to explore this website some to see Dinty’s shenanigans first hand. And then BUY THE BOOK. Once it arrives, consider reading passages aloud to your spouse or partner, or slither up to a complete stranger at the corner coffee shop and let loose a chapter or two. You’ll find yourself making lifelong friends.